Get extra savings on select sizes of ACL Staticide's popular Gemini Series Dual-Layer ESD Matting at QSource.com. These mats are made from a polymer-based, static-dissipative material that has a dissipative upper layer and conductive base. Gemini mats are durable as rigid laminates and as comfortable and appealing as rubber mats. Promo savings available on rolls (10%) and pre-cut mats (15%) and expires January 31, 2019. Please use Coupon Code ACLGEM10 to get 10% off select mat rolls and Coupon Code ACLGEM15 to get 15% off select pre-cut mats. Coupon Code must be entered at checkout to receive discount. Visit Q Source’s ACL Gemini Promo Page for information about, and to purchase, ACL Staticide Gemini Series Dual-Layer ESD Matting. You may also contact us via email or phone (800-966-6020) for large orders or other inquiries. We also offer live chat customer service on our Web site. Static Solutions’ Guest Blog offers a solution to the electrostatic discharge that is common (and potentially dangerous) this time of year. 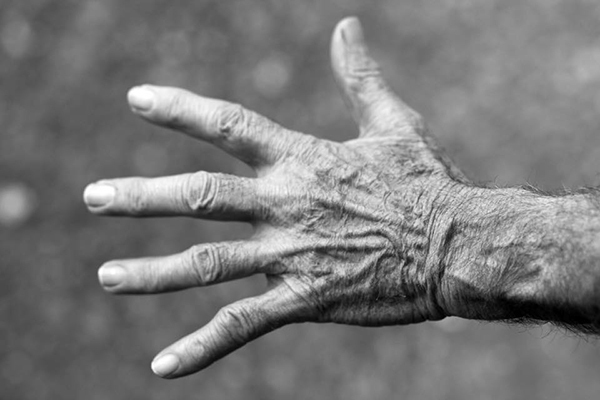 Applying moisture to your skin adds another layer of protection by increasing conductivity to your wrist strap. Placing several bottles in specific areas around the workplace, helps your team to stay protected. And, it has the added benefit of helping your skin to not dry out, crack, or flake. and help your skin to not dry out, crack, or flake. For more information about ESD hand lotion and other Static Solutions ESD control products, please visit QSource.com. You may also contact us via email or phone at 800-966-6020 and we will be happy to assist you. A big thank you to our friends at Static Solutions! We appreciate the information about ESD hand lotion. Expressing our warmest Season’s Greetings for a very Happy Holiday to you and your family. We wanted to take another opportunity to thank our loyal customers for your continued patronage. We look forward to serving you again in 2019. Happy New Year! We'll begin the New Year on Wednesday, January 2nd, 2019, with regular business hours. Please note: Our expansive, recently redesigned Web site, QSource.com, is available 24 hours a day, seven days a week for your orders or RFQ/inquiries. Orders submitted when our office is closed will be processed ASAP on the next business day we are open. We also encourage you to visit our Q Source Resource Blog and follow us on our social media accounts. For questions and further information please call (800-966-6020), email us, or chat with us live at the Q Source Web site. Enjoy the holidays! Q Source will be closed for Labor Day on Monday, September 3, 2018. The office will re-open on Tuesday, September 4th. 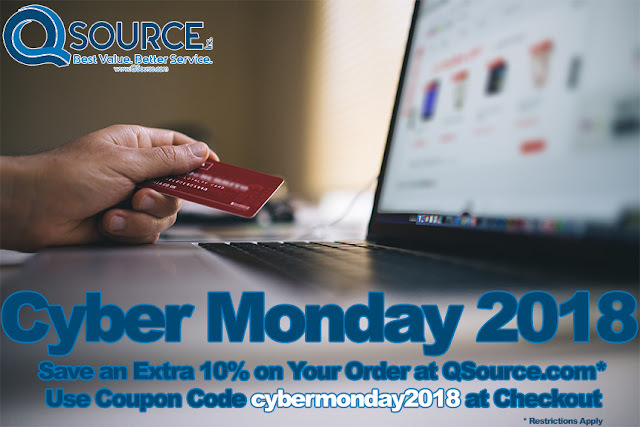 Our Web site, QSource.com, is open for shopping, quote requests, and email newsletter subscriptions 24/7, and any orders placed over the Labor Day holiday will be processed as soon as possible on Tuesday. Thank you for being a Q Source customer. Have a safe, fun holiday weekend. Remember to subscribe to our email newsletter for additional Q Source product information, reviews, how-to articles, and special offers. Receive a discount coupon code when you confirm your subscription. 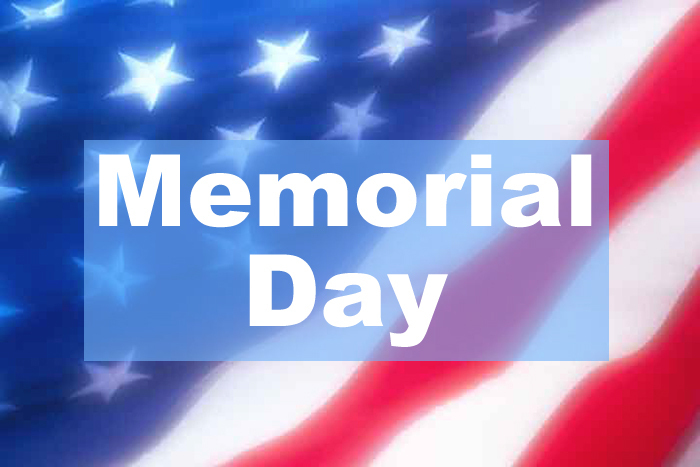 Our office will be closed on Monday, May 28, 2018, in recognition of the Memorial Day holiday. We will re-open on Tuesday, May 29th. We hope you’ll join us in taking a moment to remember the fallen soldiers who have served our country. Please note: QSource.com is available 24-hours-a-day for product information and purchases. Orders placed on the 28th will be processed on the 29th, or as soon as possible. 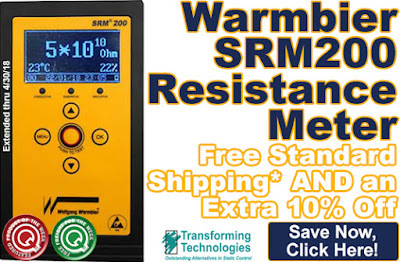 We’ve extended for another week, this week’s Featured Product promo, which gets you Free Standard Shipping* and an extra 10% off the Q Source Price of Transforming Technologies’ Warmbier SRM200 Pocket Digital Surface Resistance Meter at QSource.com. To take advantage of this discount, just add the SRM200 Meter to your shopping cart. Offer is now valid Monday, April 30, 2018, through Friday, May 4, 2018. * Free standard shipping in the contiguous United States. The SRM200 Digital Surface Resistance Meter measures resistance on a variety of surfaces (including floors, chairs, carts, clothing, packaging materials) and the readings can be stored in the instrument for transfer to PC via USB cable. For further details, please see the product page. Click here to purchase the Transforming Technologies Warmbier SRM200 Meter. For further questions, call us (800-966-6020), or send us an email. 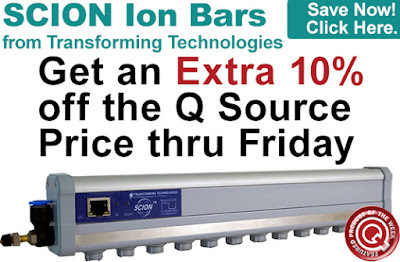 Please note: This promo is valid only at QSource.com. 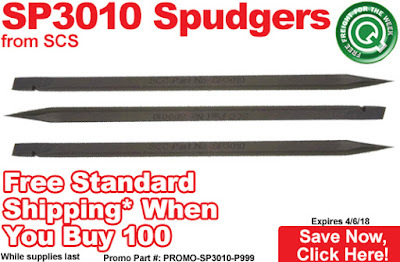 This week’s promo gets you Free Standard Shipping* when you buy 100 SCS SP3010 Spudgers at QSource.com. To take advantage of this discount, just add the special promo part number (PROMO-SP3010-P999) to your shopping cart. Offer is valid Monday, April 2, 2018, through Friday, April 6, 2018. * Free standard shipping in the contiguous United States. These spudgers are suitable for use around ESD-sensitive items. Use them to form leads, probe parts, and spudge solder joints flat. They are made of ultrastrong 33% glass-filled nylon plastic. For more details, please visit the product page. Click here to purchase these SCS Spudgers. For further questions, call us (800-966-6020), or send us an email. Please note: This promo is valid only at QSource.com. This week’s promo gets you Free Standard Shipping* on in-stock QRP Finger Cots at QSource.com. To take advantage of this discount, add eligible finger cots to your shopping cart. Offer is valid Monday, March 26, 2018, through Friday, March 30, 2018. * Free standard shipping in the contiguous United States. 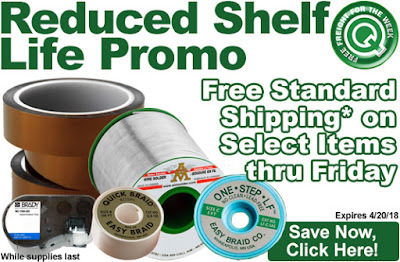 This special offer includes finger cots from QRP's 5C, 7C, 8C, 9C, and BF, Series. They are perfect for a wide range of applications and latex-free/powder-free models are available in the promo-eligible offerings. 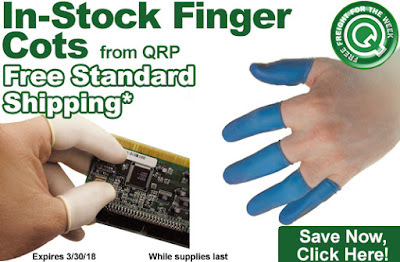 Click here to purchase promo-eligible QRP Finger Cots. For further questions, call us (800-966-6020), or send us an email. Please note: This promo is valid only at QSource.com. 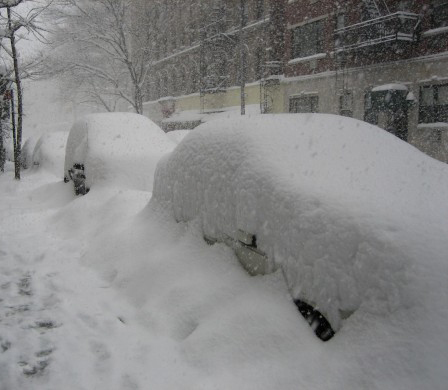 Winter Storm Toby has dumped up to 19 inches of snow in our area. Due to dangerous travel conditions, and a limited crew, we will not be shipping today, March 22, 2018. Key personnel will be working remotely to process orders and complete related tasks. Pending orders will be shipped tomorrow. Please stay tuned to our blog and social media posts for further info. QSource.com is available 24/7 and you may contact us there, via email, or live chat. We expect to be open tomorrow, Friday March 23, 2018, for regular business hours. We apologize for any inconvenience. Thank you. 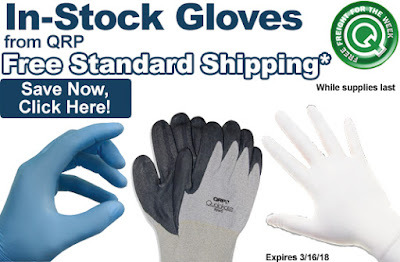 This week’s promo gets you Free Standard Shipping* on select, in-stock QRP Gloves at QSource.com. To take advantage of this discount, just add eligible gloves to your shopping cart. Offer is valid Monday, March 12, 2018, through Friday, March 16, 2018. * Free standard shipping in the contiguous United States. This special offer includes gloves from QRP's Qualakote ESD Wave Solder, ESD-safe Qualatrile SENS! 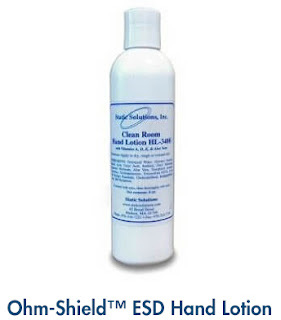 Nitrile, Qualatrile XC Nitrile Clean Room, and Qualatrile Nitrile Powder-Free models. 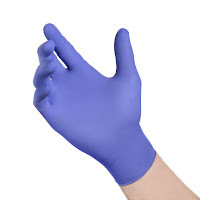 These gloves meet a number of specs and compliances and are used in a variety of applications. Click here to purchase promo-eligible QRP Gloves. For further questions, call us (800-966-6020), or send us an email. Please note: This promo is valid only at QSource.com. ATTENTION: The Q Source office will be closing at 4:30 p.m. Eastern today due to inclement weather moving through the area. 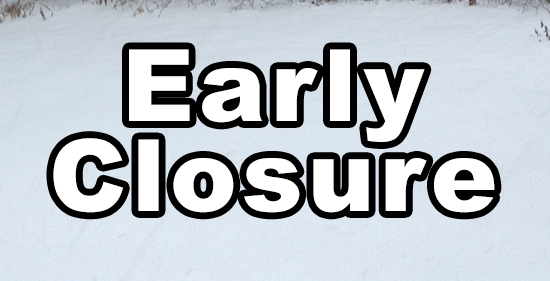 The office will be open tomorrow during regular business hours (8:30 a.m. to 5:30 p.m.). 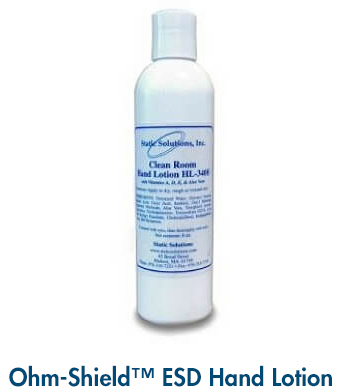 Our Web site, http://www.QSource.com is available 24 hours a day for your orders or product research. 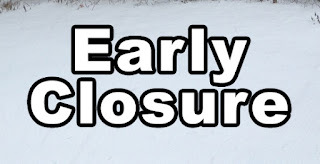 We are sorry for any inconvenience our early closure may cause. 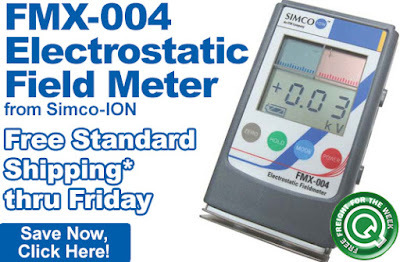 Get Free Standard Shipping* on the Simco-ION 91-FMX-004 FMX-004 Electrostatic Field Meter at QSource.com. To take advantage of this discount, just add the FMX-004 Meter to your shopping cart. Offer is valid Monday, March 5, 2018, through Friday, March 9, 2018. * Free standard shipping in the contiguous United States. The Simco-Ion FMX-004 is a pocket-sized compact and lightweight handheld meter that is easy-to-read in all lighting environments and comes in a conductive case with ground snap to facilitate grounding for accurate measurements. Locate and measure both positive and negative polarity charges with this best-selling electrostatic field meter. Click here to purchase a Simco-ION FMX-004 Electrostatic Field Meter. For further questions, call us (800-966-6020), or send us an email. Please note: This promo is valid only at QSource.com. 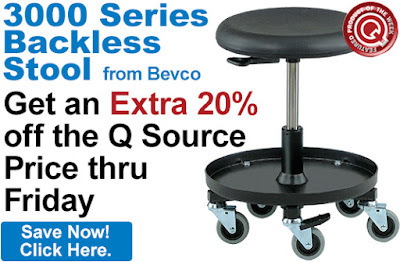 Get an extra 20% off the Q Source Price on the Bevco 3057-BK 3000 Series Backless Maintenance/Repair Stool. To take advantage of this discount, just add the 3057 Stool to your shopping cart. Offer is valid Monday, February 26, 2018, through Friday, March 2, 2018. The 3057 Stool is built for durability and comfort to fit a wide range of applications. It features a built-in tray to hold tools while working, 15.5"-20.5" height adjustment, 3" casters (2 w/locking brakes), a 12-year warranty, and is LEED certified. Click here to purchase a Bevco 3057 Backless Stool. For further questions, call us (800-966-6020), or send us an email. Please note: This promo is valid only at QSource.com. 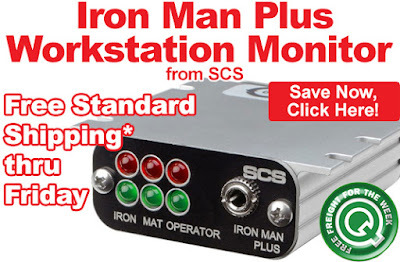 Get Free Standard Shipping* on SCS’ Iron Man Plus Workstation Monitor. To take advantage of this discount, just add an Iron Man Plus to your shopping cart. Our Free Freight promo is valid Monday, February 19, 2018, through Friday, February 23, 2018. * Free standard shipping in the contiguous United States. This compact monitor offers overvoltage monitoring of electronics assemblies, operator wrist strap and body voltage monitoring, and dissipative mat ground monitoring. Visit the product page for complete details. Click here to purchase an SCS Iron Man Plus Workstation Monitor. For further questions, call us (800-966-6020), or send us an email. Please note: This promo is valid only at QSource.com. OSHA has cited that work-related musculoskeletal disorders or ergonomic injuries have direct costs of “$15 to $20 billion per year, with total annual costs reaching $45 to $54 billion.” For example, the repetitiveness of cutting tape can lead to carpal tunnel syndrome, strain, and inflammation. 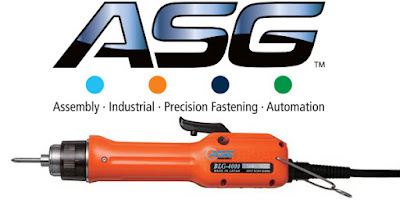 Using a tape dispenser such as those from ASG’s EZ Series can reduce these ergonomic injuries. ASG’s best-selling user-friendly tape dispenser, the EZ-9000GR Automatic Tape Dispenser, is one popular option. It offers features that increase the efficiency of your assembly process and eases the workload on your employees. Let the EZ-9000GR do the work for you. With the cost of some specialty tapes costing $30 to $50 or more per roll, using a tape dispenser goes much farther than ergonomic benefits. Eliminating waste could easily prove out the Return on Investment (ROI) for your tape dispenser. The EZ-9000GR has up to six different cut lengths and it can be programmed to cut by selection or in sequence. The modular blade and roller unit allows for easy on-site maintenance. The EZ-9000GR features dual photo sensors which allow two rolls of tape to be cut at the same time. In addition, the EZ-9000GR can cut non-adhesive tape and a variety of tape thicknesses. Using a tape dispenser improves operator ergonomics and saves time and money. The tape machine dispenses an exact, programmable length each time, which reduces waste. It also has an automatic button, which dispenses the next piece of tape as soon as the previous piece is removed, therefore saving the user time. 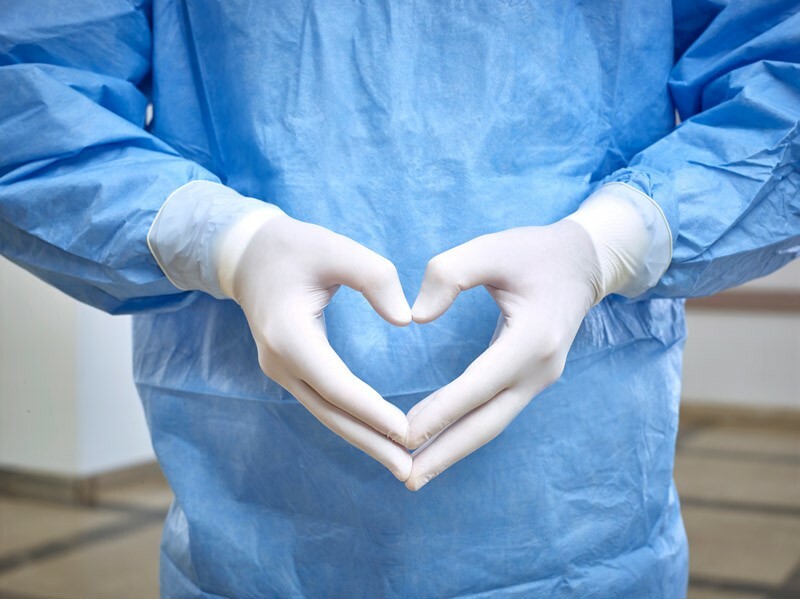 Reducing waste, saving time, and avoiding user injury lead to cost savings, a positive return on investment, and worker satisfaction. 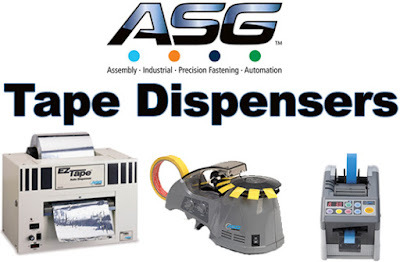 ASG’s line of tape dispensers are sure to increase efficiency and lessen worker stress. 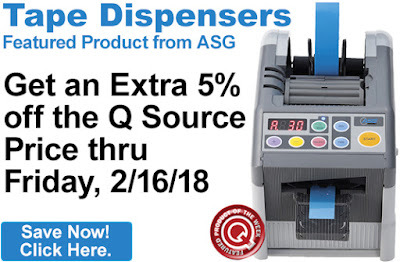 EDITOR’S NOTE: QSource.com is currently having a Featured Product Sale on ASG Tape Dispensers. Get an extra 5% off all models thru Friday, February 16, 2018.